I used this cute Chi Chi Memories image called Girl's Talk and the sketch from My Favorite Things to make this little card. I flipped the sketch and then also used the colors from My Favorite Things color challenge. 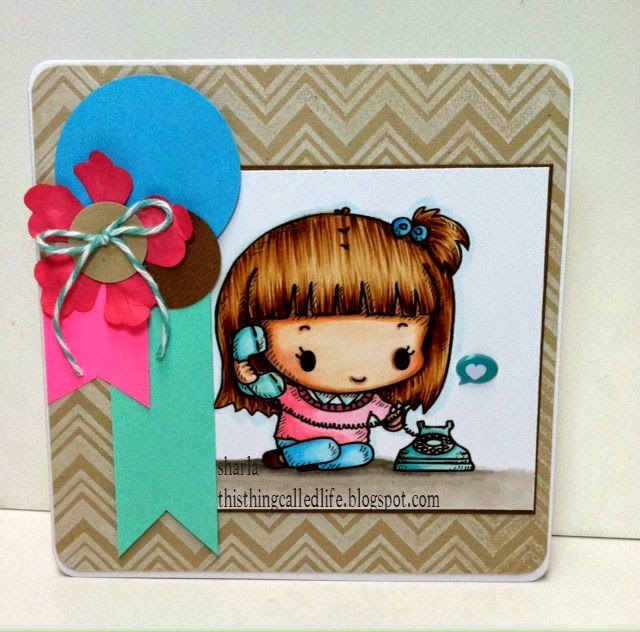 The chevron in the background is a stamp from Heidi Swapp and I just inked it with white ink, then followed the sketch using papers from my stash and prima flower, some twine, the cute heart speech bubble and punches for the circles. I kept it pretty clean and had a hard time not inking up all the edges.....I almost can't stand to leave things clean, but I think it's cute and the image is totally darling! Beautiful card. thanks for joining us at The Crafter's Cafe this week. Love your card and colouring! Thanks for joining us at The Crazy Challenges.